The combination of a heavy platter with sprung suspension makes vinyl sound powerful and solid. Some will crave a more refined sound, but there's no denying the combined appeal of detail, power, image scale and groove factor on offer here. 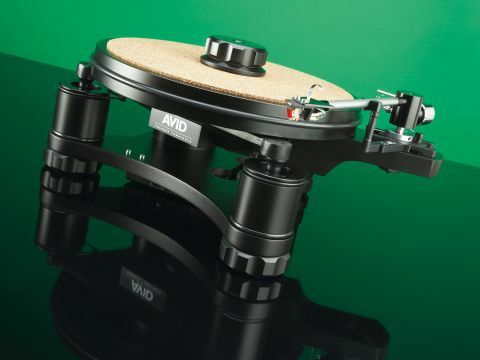 Avid has grown to become one of the UK's foremost turntable makers thanks to the popularity of its heavyweight, sprung-subchassis designs. The Volvere is its base model and its appearance here marks the first major revision that the design has had since its introduction. Avid's turntable range is fairly compact and is comprised of just four models; first comes the Volvere, seen here in an all-black version with green LEDs, specifically finished to match Naim equipment (it comes in silver, too). Next up is the Volvere Sequel, which has the same platter and chassis, but an upgraded motor and power supply. Then you get to the Acutus, which comes in basic and Reference guises, with the latter costing £6,500. The Volvere has changed in a number of small but significant ways; the main bearing was originally made from aluminium but is now fashioned from stainless steel, while the record clamp and adjustable feet are now scalloped rather than being knurled. This is both easier on the fingers and, in our opinion, also more attractive. More importantly, the thread on the clamp has been coarsened so it's much quicker to put on and take off, a significant factor given that you have to do this every time you change a record. The suspension has also been changed to allow adjustment from above with a supplied Allen driver, whereas previously you adjusted it at the side. The current method is very easy once you get used to the idea that you're turning a spring and the high degree of friction involved in that action. The Volvere can be upgraded to Sequel status should the funds become available. What you get with this deck is a heavyweight platter topped with cork that sits on a tapered stainless bearing, with the mass being taken by a tungsten-carbide ball at the top of the spindle. Unusually, this bearing doesn't require the addition of oil, but has oil-impregnated phosphor bronze bushes like those found in electric drills. Heat caused by friction draws the lubricant out of the metal, making it self-lubricating. Avid uses a large tapered shaft that fits over a spindle fixed to the aluminium casting that forms the suspended part of the chassis. The subchassis then sits in three springs and forms an extremely rigid platform for the arm and platter. Being a casting, it's not quite as slickly finished as the MDF that forms the base of the chassis, but it's solid and carefully shaped to minimise resonance. Another change that Avid has made to the suspension is the way that the damping 'O' rings now hook onto screws on the underside of the subchassis. Previously, the design was more complex and presumably more expensive to make, but this arrangement seems to achieve the same end of controlling excess movement in the springs. The motor's drive shaft sits under the platter, which makes hooking on the drive belt a little fiddly, but keeps belt length to a minimum. The belt used here is a round section, and Avid claims this type can move up and down the sub-platter with greater ease than flat belts. The high-torque PAPST motor is driven by a power supply located on the underside of the chassis; this keeps costs down by avoiding an extra box and keeps practicality high by having the switches on the turntable where they should be. The only drawback with the arrangement is that you have to find the stop/start switch by feel, as it's hidden underneath the platter - it's easy to press the speed change by accident. The Volvere's armboard is drilled to suit SME arms, but can also accept other types, including Rega's, with a suitable mounting plate. Avid doesn't supply tonearms itself, but has recently been getting good results with Naim's ARO unipivot design, Naim systems being one reason why the black finish was introduced. Avid is making an SME-style sled mounting for the ARO, the first example of which was supplied for us to try. It brings the opportunity to adjust overhang alignment, which means that this Linn cartridge-oriented arm can be used with other types, possibly for the first time. The set-up process isn't intrinsically complicated, although at first glance the instructions may make it seem so. Luckily, it's usually carried out by the dealer anyway. We started out using our benchmark tonearm - the SME Series V - on the Volvere, because it lets us know what the turntable itself is contributing to the party, and also because it's a doddle to set up. Once in action, the Volvere delivers a substantial sound. Its forte is bass, which it delivers with a weight and power that's rare among turntables at this price. If digital has any advantage over analogue, then bass is its trump card; silver discs can't match the natural sound of vinyl, but they do generally offer more powerful bass. No more, though. Here, vinyl has a weapon with which it can compete against digital on its own terms. You want slam, grunt, girth even? You got it. Further up the band, things are pretty decent too. The midband isn't as refined as, say, that of the dps2 we're reviewing for The Collection 2007, but it keeps meticulous time and delivers a detailed and stable soundstage that you can walk into. The treble is well extended and has more sparkle than our reference SME 20A, the lap steel guitar on Joni Mitchell's Hejira album sounding uncannily real in its capable hands. The quality of treble is also responsible for the precision in the bass. Perhaps surprisingly, you don't get crunchy bass without clear-cut treble. The Volvere is also more on the ball when it comes to rhythm and timing, surprisingly making the SME sound relatively cumbersome in comparison. Dynamics and absolute resolution are both areas that could be enhanced. Rickie Lee Jones's Flying Cowboys is an unusually plush-sounding recording, but here some of its gloss is missing. This may be because the Volvere is a shade monochromatic and doesn't indulge tone colour as much as some designs. We're not saying that it doesn't bring out instrumental timbre, just that other designs bring out a little more. It's likely that a different cartridge to the vdH Condor used as a reference would do better; a Koetsu, for example, or the more fruity-sounding vdH Grasshopper. With the Naim ARO unipivot in Avid's custom-made sled base, the Volvere turns in a pacier, more nimble sound that encourages extended listening sessions, despite delivering less of the deck's bass power. Unipivots tend to be more fluent and less mechanical-sounding than rigid bearing arms, and the ARO did precisely this while delivering good solidity of image and an attractively open and spacious sound, albeit one which seems to major on image width rather than height. There's still plenty of bass with the ARO, just not quite as much - the action being centred on the midband, the heart of the music. You also get a sense of better bass articulation because it's not quite as extended; bass lines tend to be more nimble and give the overall sound the classic Naim 'groove'. The new Volvere is a welcome replacement for what was already a very good turntable. It has a good deal of the power associated with the bigger Avids and delivers a solid and precise sound that makes a lot of competitors sound decidedly weak. If it's not as refined as some, that's because its strengths lie elsewhere. However, given the price, it represents a definite benchmark.